Dog licking face, eating cake and Lewis squealing with excitement. 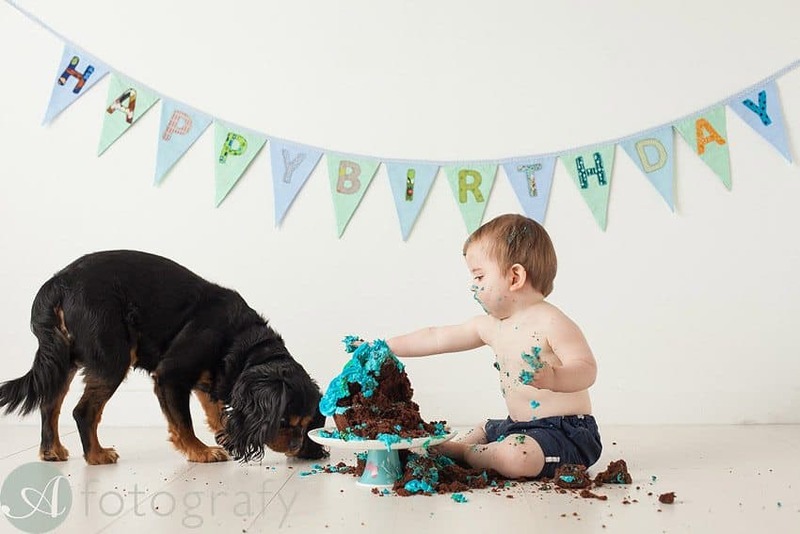 This was super cool cake smash photography session with little Lewis and his furry friend. When parents mentioned about possibility to bring their dog, I was like of yes this sounds super exciting. At the same time I was a bit worried how the whole cake smash and dog being around will go. Like always we created some nice individual baby portraits and took some fun family ones too. Cake smash was a hit and everyone really enjoyed a good piece of cake. We have made a little photo slideshow about it and you will see few video clips with Lewis and his friend enjoying cake too. I think it needless to say that after you will see these photos you will love them. Parent also left beautiful experience story for me. ” We organised a cake smash photoshoot for our sons 1st birthday with A Fotografy and couldn’t have been happier with the end result. Armands took new born photos the year before and at the time mentioned about the cake smash and on seeing some examples of these we looked forward to taking our son to have them taken for his 1st birthday. When organising the shoot we asked if we could bring our dog with us as we thought it would be nice to involve him. Armands was happy for him to be involved and up for the challenge – he seemed intrigued with how a cake smash with a baby and a dog would go! We were a bit anxious before about bringing our dog however he was allowed to roam around the studio and make himself at home in between shots and other than a close call with the cake before the shoot started all went well. The new born photos the year before showed us his relaxed style which we liked so it was an easy decision to go back. On the day of the shoot we debated about what outfits to bring and appreciated his advice and suggestions on what would work best for the photos we had in mind. Cake Smash gallery will start with newborn portraits of Lewis first. If you look at awake shot you will notice that his facial expression hasn’t actually changed. I always love to see babies coming back for their update portraits. Watch cake smash photo slideshow with video clips of both of them eating the cake.